I LOLed the second I saw this picture. I’ve never been a fan of the “Keep calm and …” phrase after it had been overused in the past 2-3 years, but this particular one is so hilarious. You have to piece the entire phrase in your head, you see, and I came up with “Keep calm and be duh”. And I imagine Patrick Star saying it in his low duh voice. And then I laughed at my own wit. 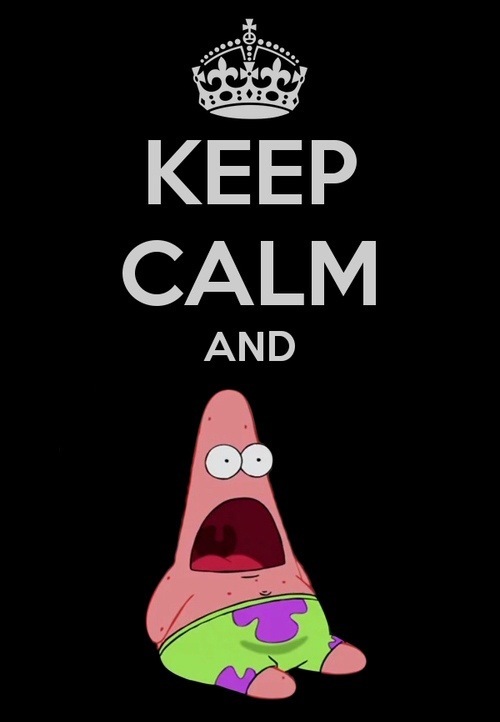 Maybe because Patrick Star reminds me of myself. Duh! Whatsapp shy face. HAHAHA! Also, you shouldn’t be with him. You should be with me. Yes, really, because things between us don’t just happen, y’know. Or at least not to me. Really. In movies, TV shows and fairytales, the girl would run over and kiss me after hearing that. If only. P/S: I found this really great website with all the transcribed scripts for all 10 seasons of everyone’s favourite TV comedy Friends, so if you ever want to, I don’t know, have a laugh, feel free to click on it.